Volunteers are the glue of our community. 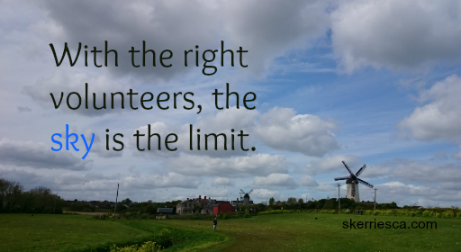 Every year, Skerries Community Association awards a prize to an individual or a group of volunteers. This year the nominee can be a young person, an adult, or a group – the only thing that matters is that they are deserving prize winners! This prize is awarded every year in appreciation of volunteering work done in Skerries. You can read more about Jim Quigley and the prize, as well as see a list of previous winners, on our website. Please forward nominations with as much information as you can giving the reason why you would like this person/group to get the prize. The judges are outside the Town and need guidance on what the nominee does to help them make a fair decision. Nominations to mary.conway@skerriesca.com before the last day of May 2015.